Brain implants, also referred as neural implants are connected directly to the brain either by placing on the brain surface i.e., over gyri and sulci, or they are attached to the cortex of brain. When brain becomes dysfunction because of various reasons such as head injuries and stroke, brain implants are used. Brain implants electrically stimulate, block, record or both record and stimulate simultaneously signals from single neurons or groups of neurons in the brain. Globally, growing incidences of various neurological disorders especially Parkinson's disease, rise in aging population, and increasing prevalence of major depressive disorder are the prime growth drivers of brain implants market. In addition, technological advancements and emerging economies such as China, India and others, will create new opportunities for brain implants market. However, higher cost of the device, complexity of neural processing, and safety concerns are the key restraints for brain implants market. This report identifies the global brain implants market size in for the year 2014-2016, and forecast of the same for year 2021. 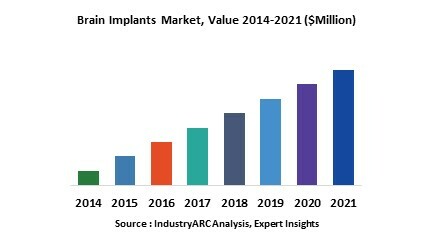 It also highlights the potential growth opportunities in the coming years, while also reviewing the market drivers, restraints, growth indicators, challenges, market dynamics, competitive landscape, and other key aspects with respect to global brain implants market. 13.3. St Jude Medical, Inc.